This is what it looked like 12 years ago - no houses! Back then it was a truly lunar landscape. This is what it looks like today in 2011. 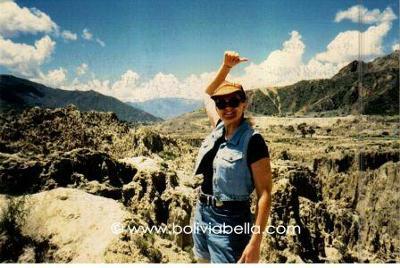 The Valley of the Moon, or Valle de la Luna, is located about 10 kilometers from downtown La Paz, Bolivia toward the southern end of the city. This Valley, much of which is now built up with houses, can be reached easily by bus or taxi. 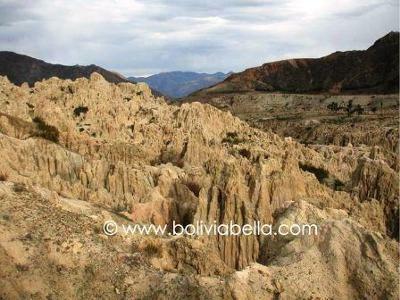 The Valley of the Moon is located near a small town called Mallasa. Its "lunar" landscape can be attributed to the erosion of the soft soil in this area. The main attraction is the landscape itself. There isn't much in the way of wildlife to see, other than some cacti and a few small flowering plants. Locals have named some of the rock formations after shapes they believe they symbolize such as la Madre Luna (mother moon), and el Sombrero de la Dama (lady's hat). 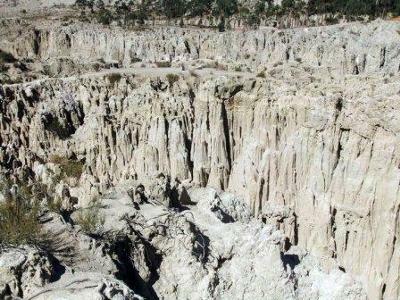 Tourists can visit Valle de la Luna and hike around on special walking tracks that have been set up. Be aware the soil is soft and breaks away easily. Above you can see 2 photos I took of the Valley of the Moon just 12 years ago (without any houses). Click to the next 2 photos taken by Matt Haikin www.matthaikin.com in 2011 to see what it looks like now. It's difficult to believe entire neighborhoods are being built on this unstable soil. 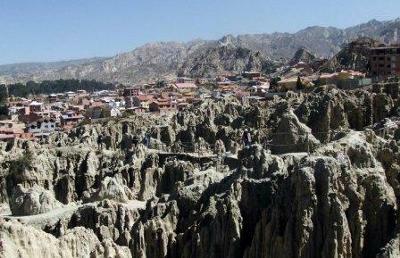 Mallasa is also where the La Paz zoo is located. So make a day-trip out of it and pay a visit to both. Be sure to wear sunscreen and a hat and take plenty of water for your Valley of the Moon walk.